It’s amazing the impact that receiving a package can have on someone when they work from home. Especially someone with a love of peaches like mine! Pittman & Davis has been offering deliciously juicy tree-ripened fruit and gifts since 1926. 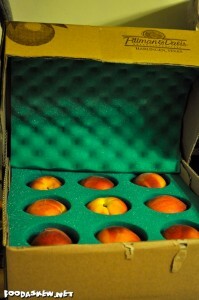 Recently, they were kind enough to send me a shipment of California Peaches to taste and tell you all about! Before receiving the shipment, I was a bit worried about the condition of the fruit once it arrived here. I know that, because of California agricultural regulations, they were shipping from within California so it wouldn’t be that far of a commute from the tree to my mouth. Each individual peach was packaged in it’s own foam pod with plenty of foam spacing between them to save the delicate skin. There was also a protective slab of foam on the top, as you can see here, to further make sure that the peaches were not damaged in shipping. Upon careful examination of each peach, there were a couple of little bruises, but I expected much worse considering how easily peaches tend to bruise when just hanging around the kitchen minding their own business, let alone being shipped. Tree-ripened apparently makes a huge difference between the peaches I normally pick up at my local Safeway and these Pittman & Davis peaches. They were immediately juicy, sweet, and the perfect texture. Opening the box was heavenly just for the ripe fresh smell, which I definitely didn’t expect considering the amount of cardboard and foam involved. 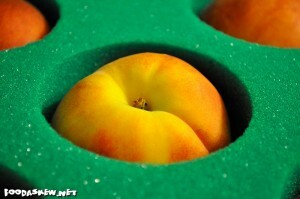 Sometimes peaches can be a bit grainy, but these were everything you’d want in a peach. I was very impressed that they were ready to eat upon receipt. I assumed that they were likely shipped slightly under-ripe and would need a day or two to ripen. 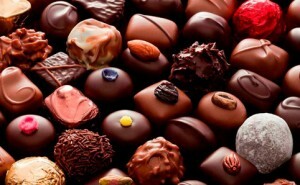 It seems that the growers ship them at just the right time so they’re perfect by the time they get to your door! When their website says “with each bite the sweet juice will be dripping down your elbows”, they’re not kidding! 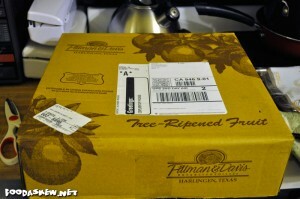 A shipment of 9 sweet California peaches from Pittman & Davis costs $44.85 with free standard shipping. While this seems a bit pricey, consider the packaging costs to make sure these delicious gems arrive in good condition and the convenience of getting them straight to your door. Yellow peaches at my local Safeway are currently $2.49/lb. so while they are cheaper, they’re not as good as these peaches. While the cost may be prohibitive to make Pittman & Davis your every-day supplier of peaches for your smoothies, it’s a great gift for a friend or loved one who could use a little sunshine in the form of a juicy, fragrant, soft peach. Hey boys and girls, have I got a gift for you! 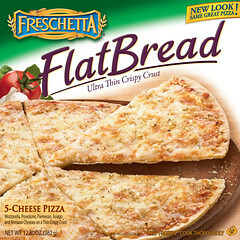 I was contacted by Freschetta® Pizza and they asked me to review their new Freschetta FlatBread Pizza variety. Being an every day fan of Freschetta®, I had no problem giving this new variety a shot. I normally prefer a thicker crust on my pizza, but after a great experience last summer giving real New York City thin crust pizza a try, I was definitely willing to check out some other crust options with this FlatBread variety. Not being a fan of a lot of toppings on my pizza, I gave the Five-Cheese a shot. A small, crispy pizza seemed like a perfect light lunch for a Sunday afternoon. I really liked the crust for a change of pace… it was light and crispy. It didn’t seem like the traditional pizza to me, but it was still tasty. Though I didn’t go for one of the topping heavy varieties, the cheese was very good and the sauce was light, again contributing to the lightness of the pizza. I know my husband will appreciate that there are a variety of flavor combinations (Zesty Italian, Roasted Garlic and Spinach, Pepperoni, and the Five-Cheese I tried) so when I get these in the future there’s something we’ll both like. The frozen pizzas we usually eat are Bagel Bites and Mama Celeste, so hopefully I can ween him onto this since it’s SO much better. And despite the coupon, they really weren’t that expensive anyway…less than I’d thought. Lucky for you, Freschetta® sent me coupons for a FREE Freschetta® pizza so I could try it out. I have 3 left to give away, so the first three comments on this post will receive the coupons via mail. They’re only good until 5/31/10 so be sure to follow up your comment with an email with your address so I can put the coupons in the mail for you. United States and Canada residents only, please, as I don’t believe the coupons are valid internationally. Don’t worry – if you’re not one of the first three to request the free pizza coupon, you can always go online and get a coupon for $1 off Freschetta® Pizza! So leave your comment, send your email, and I”ll send YOU one of these 3 coupons for a FREE Freschetta®Pizza!